Osborn Load Runners cam rollers are specially designed to tolerate both thrust and radial loads for heavy-duty applications. 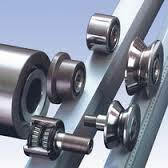 Using tapered roller bearings or deep-groove ball bearings, these rollers are engineered for convenience. Along with Osborn Load Rails, precut and drilled to your specifications, Load Runners are the complete solution for linear motion control.